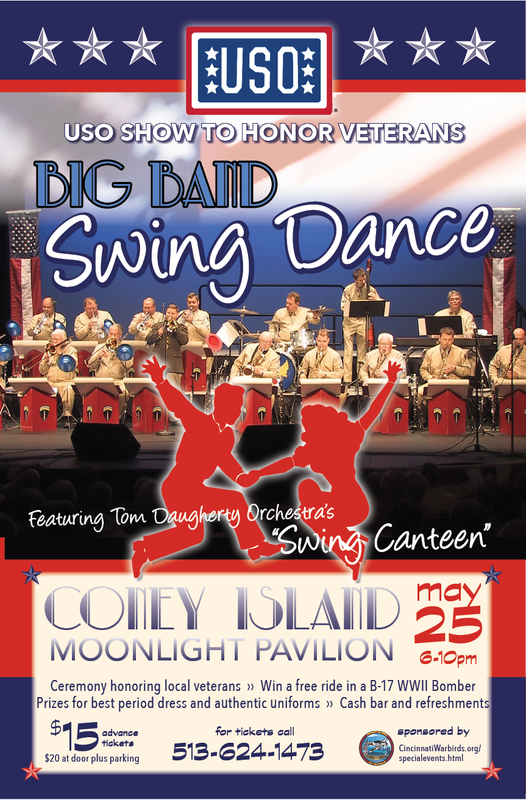 featuring the Tom Daugherty Orchestra's "Swing Canteen"
and the Swing Dancers from Cincinnati Lindy Society. Prizes for the best period dress! Intermission ceremony honoring local veterans! Admission is 20$ per person at the door or in advance for 15$ thru Coney Island 513-624-1473. Advance ticket sales carry a $2 service charge per ticket. Parking NOT included. Tables of 10 may be reserved in advance only with purchase of 10 seats. Advance tickets will be available for pickup at the door the evening of the event. USO and the USO logo are registered trademarks of the Untited Service Organizations, Inc. This use of USO has been approved by the USO.